Why shop at Village Lights? Out of print? Hard to find? We can help! 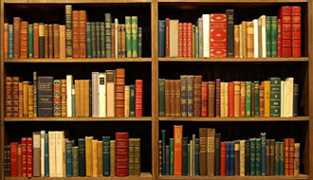 We have an extensive stock of used books on hand, so you can call us to see if it's on the shelf. If we don't have it, we can do an out-of-print book search for you. Or... you can use the tool in the right side panel of this webpage to do your own search from among over millions of used, rare, and out-of-print books listed on Biblio.com, an independent used-book search marketplace. Biblio has partnered with the American Booksellers Association (including Village Lights) to further benefit locally-owned independent bookstores. When you click through the "Search" button in the right sidebar, a new browser window will open, and you’ll see a few select items listed by Village Lights. You can then peruse or select from our offerings or click the "Friends of Village Lights Bookstore" button at the top of the page to browse among offerings from other members of the American Booksellers Association. Once you’ve created an account on Biblio through our website, we will receive a percentage of any purchase you make. But don’t forget, we have a lot of experience. If you don’t find what you’re looking for, give us a call. We’d be more than happy to search and place an order for you. If that which you seek is truly rare or collectible, we strongly recommend that you contact us directly to handle the searching and ordering for you. We charge a conservative fee for the service, but, as we have the skills and know the field, we can save you potential inconvenience, aggravation, and undue expense. Biblio.com was founded in 2000 and is based in Asheville, North Carolina. Their goal from the start has been to preserve a local business experience, with the emphasis on service and community. To that end they have created BiblioWorks, a non-profit which has helped build 11 libraries in Bolivia, among many other worthy projects. They were also the first bookselling marketplace to offer carbon-offsetting on all orders shipped through their site. More importantly, they have maintained the look and philosophy of a local bookstore, as Amazon has “assimilated” other used book search marketplaces. Shopping with Biblio affords you the opportunity to support Village Lights while fostering the values of "buying local" worldwide.